Wilson North Carolina is the most depressing city I have ever been. Although it is the County Seat (which means the Circuit Court and Government buildings are located here) and it is lunch time on a Monday, the streets are deserted with 80% of the buildings boarded up. Another 10% of the business closed. It would be a great place to film a disaster or zombie movie. It did have a couple of antebellum houses, like this one. 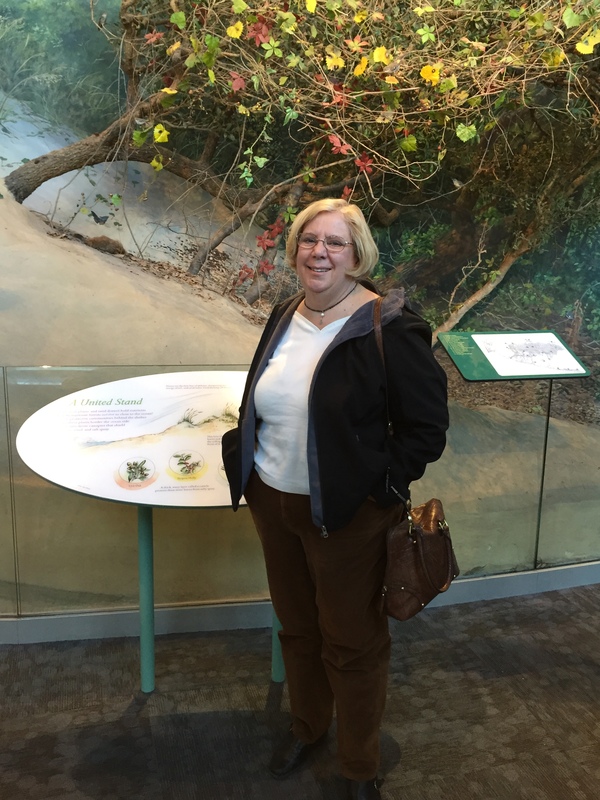 Barbara was impressed with the rose garden, which was in a most unlikely place, the Public Library grounds. I was so astonished with the condition of the County Seat, (being a lawyer I have been to all 22 County Seats in the State of Maryland, all of which were bustling places) that I went back to the visitor center to ask the hostess, who is a life long resident. She informed me that when tobacco died, the town died. Although they still grow tobacco here, it is shipped to other parts of the State for processing. 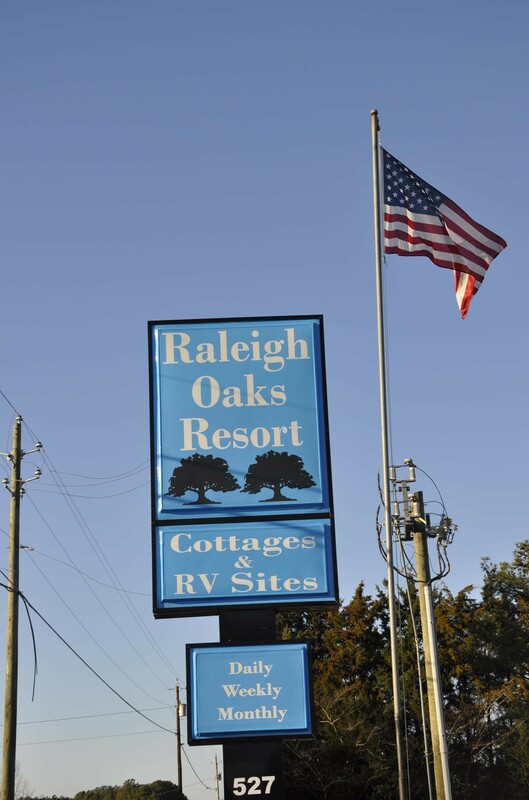 We spent 3 nights at Raleigh Oaks RV Resort. 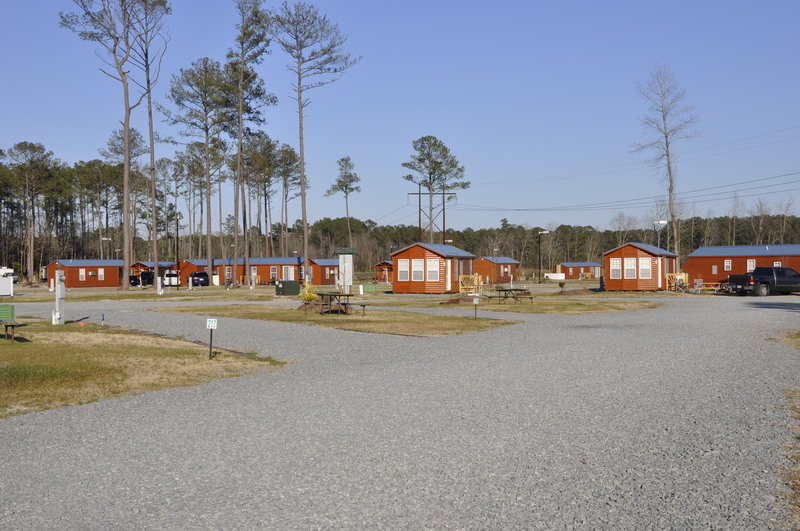 The current owners purchased the resort from the KOA organization, but it is now their private resort no longer associated with KOA (Kampgrounds of America), a national organization of camp grounds. 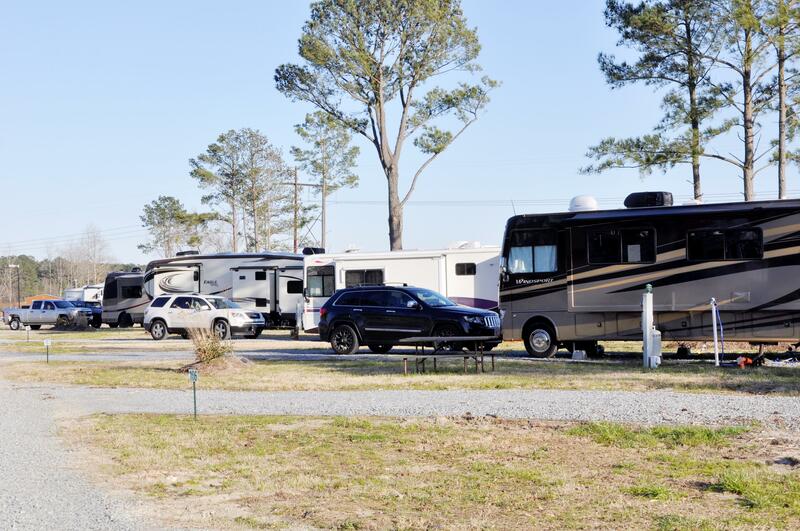 The Campground has 150 RV sites, 30 cottages, 2 full size swimming pools, a spa, fitness center, numerous game courts as well as a tennis court. Obviously, this time of year, a lot of the amenities were closed. They serve complimentary coffee, juice and waffles each morning. The employees could not do enough for you. Most of the sites are pull through, no backing up. All had picnic table, fire pit, water, electric, and waste disposable. 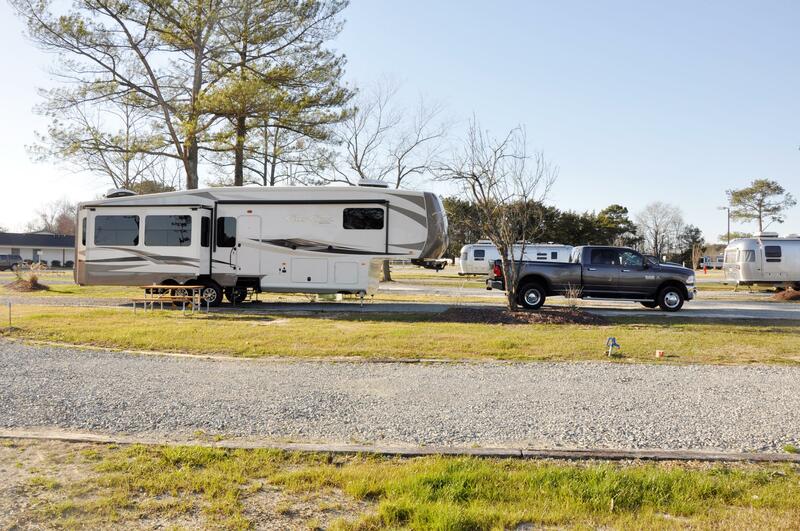 Like most RV parks, the sites are close together. 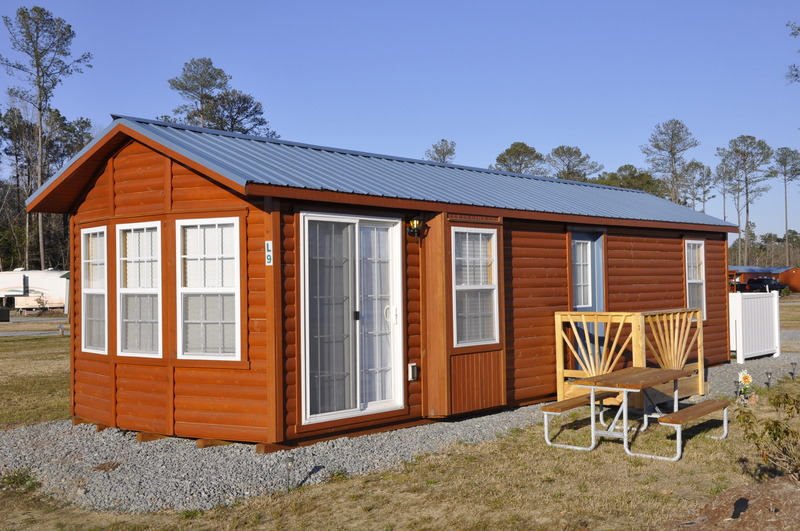 When we hooked up our cable to the park’s cable outlet at our first RV park, Williamsburg, VA., to our new 48″ HD TV, the station’s came in with lots of static. The stations over our roof antenna, came in clearer, but some still with snow. When we hooked up our cable to the outlet at the Raleigh Oaks Resort, the same thing. We asked the host if their was a problem with their cable, they asked if I turned on my booster. I did not know I had a booster, much less as how to turn it on. I had no idea even where it was. She was kind enough to send over one of her employees with a lot of experience with RVs. He was at my RV before I could walk from the resort office back. He pointed out that each RV is different, but each has a switch which must be activated to transfer the signal to the TV from antenna to cable and back. He first looked at my TV, not their, next at the wiring coming into the RV, not there, next at the bedroom TV, not there. I informed him there was a box with switches down low behind the main stereo system, not there. I then remembered that one of the cabinets below and to the left side of the TV had a box with a cable. That is where it was. It was a black small push button, mounted on a black box in a dark cabinet. I could have looked for a year and not found it. How many other things are lurking in hidden places on this unit that I don’t even know enough to ask where they are? Raleigh is the Capital of North Carolina. About the same as Baltimore, except the people talk funny. Actually, Raleigh is much cleaner than Baltimore. Upon our arrival we were embraced by the local people. We walked around the Capital building and had lunch at a neat hot dog joint called “Tasty 8’s Gourmet hot dogs”. We then visited the local museums. 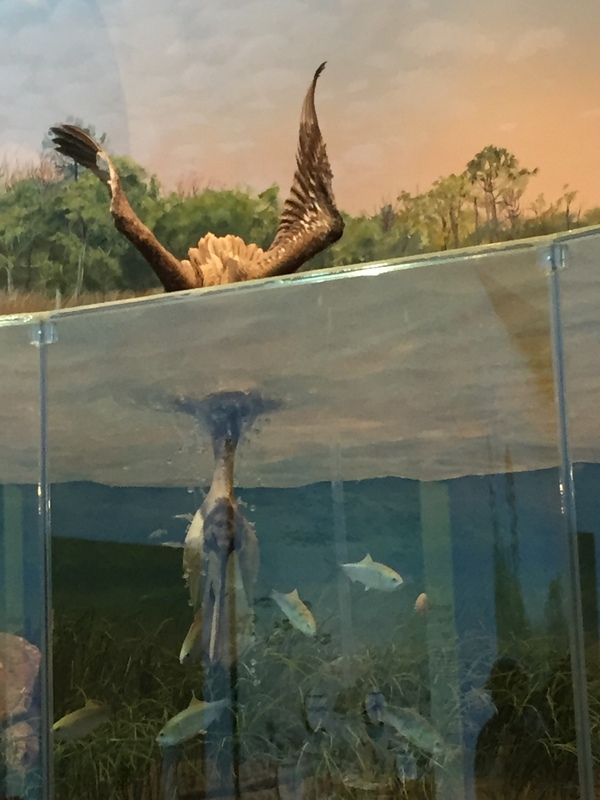 WATCH OUT FOR THE DODO BIRD!!!!!! 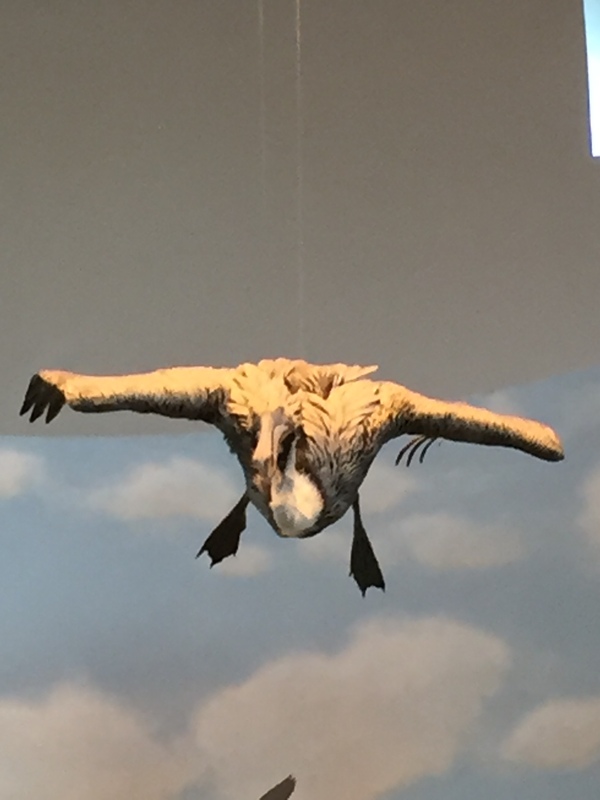 Actually, it’s a brown pelican. Never having used propane before I did not realize how it was measured. Spending the time in our driveway we went through the first tank in 3 days because of the cold temperature down to 4 degrees. A neighbor told us that the local hardware store, 2 miles from our house, filled propane tanks. We took our 30 pound tank to them and I asked to watch as they filled. The tank has marked on it that it weighs 25 lbs. empty. The attendant weighed the tank and added 30 lbs. of propane to make the new total tank weight 55 lbs. They charged 79 cents a pound. which came to $25.13 including tax. When we got to Williamsburg, I asked at the RV park the price of propane and was told $2.92. I mentioned that is quite a jump from what I paid at home of 79 cents. The reply was she could not buy it wholesale at that price. Barbara then called around to find other suppliers of propane and learned that the quote we got at the campground was per gallon of propane, 7.2 to fill our tank, and not per pound. So, as it turned out, the cost at the RV park was less expensive than the cost at home. If any of my readers who use propane can further enlighten me, please leave a comment. How do I measure the amount remaining in the tank? The gauge on my tanks are either all red (empty) or all green (full) but no graduation in between. It is a beautiful day, the rain and wind have stopped. Time to move on toward the warm weather of Florida. We are still learning how to pack the RV so that things don’t break as we travel down the road…..We are STILL learning. Fortunately, we can spend the money that would go to our son and granddaughters to replace these items. Sorry guys, fend for yourself. Grandma Barbara is spending your money. We traveled 4 hours to Four Oaks, North Carolina for a 3 day stay to visit the surrounding area. Again, we are still learning how to level the RV. The 3 slide outs cannot be employed until the unit is level.The automatic leveler is not that automatic, probably because we are not doing it correctly. The manuals that came with the Cedar Creek were not that detailed or informative. Trial and error is how we are learning. It is amazing how much error exists.